Ameren Missouri plans to invest $5 billion to improve the statewide electrical grid. For Caya Aufiero, a power outage is more than an inconvenience. When one occurs, business at Urban Eats — a restaurant she co-owns in Dutchtown — can come to a standstill. Across St. Louis, such outages are becoming increasingly common as underground wiring installed nearly a century ago deteriorates. Ameren Missouri is spending billions of dollars to upgrade the state’s electrical grid, fixes that will include repairing lines. In the Dutchtown neighborhood alone, Ameren Missouri has recorded a dozen power outages over the past six months, some lasting several hours at a time. Dutchtown’s issue is an electrical short in an underground cable dating to the 1930s. The utility company is replacing the cable, which runs the length of 12 city blocks. The frequent outages have kept Aufiero and her staff on their toes. 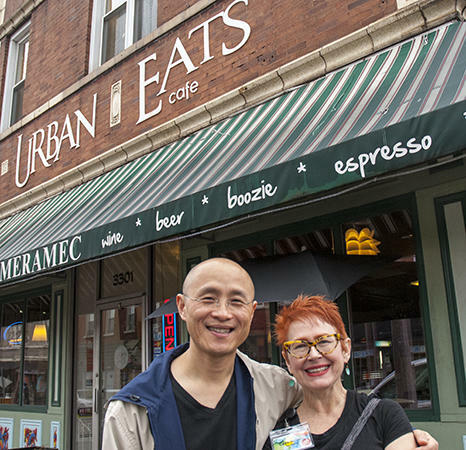 John Chen and Caya Aufiero, co-owners of Urban Eats Cafe in the Dutchtown neighborhood. When the power goes out, they consolidate all of the perishable food from 13 different pieces of equipment into a single fridge and freezer powered by a generator. In addition to losing perishable food, Aufiero said power surges have damaged at least six pieces of refrigerated equipment beyond repair in recent months. To protect against future surges, Aufiero spent nearly $1,000 for an electrician to install surge protectors on the main electrical panel of the building. Moisture is the enemy of old electrical wiring. If water penetrates Ameren’s underground electrical cables, it can trip the protective device at the substation and cause an outage, said Darnell Sanders, director of Ameren Missouri’s underground division. Once the moisture is gone, the cable will re-energize. Ameren Missouri crews first identified the faulty cable in Dutchtown in mid-February. Although customers may have experienced some “power-quality” issues over the past six months, Sanders said he isn’t aware of any power surges connected to the faulty cable. The cable replacement in Dutchtown was 65 percent complete as of March 19, said Sanders. He expects the project to be finished by the end of the month. The company had originally planned to replace the cable next year as part of its $5.3 billion Smart Energy Plan, but decided to fast-track its replacement last month. As part of the Smart Energy Plan, Ameren Missouri plans to install more than 400 miles of new underground cable and replace 12,000 electrical poles across the state.